The New Jersey Legislature is the legislative branch of the government of the U.S. state of New Jersey. 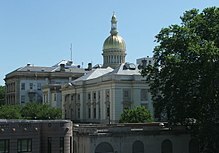 In its current form, as defined by the New Jersey Constitution of 1947, the Legislature consists of two houses: the General Assembly and the Senate. The Legislature meets in the New Jersey State House, in the state capital of Trenton. — Excerpted from New Jersey Legislature on Wikipedia, the free encyclopedia.